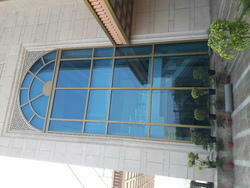 Efficient name in the industry involved in offering the optimum quality of Aluminum Window Glazing. We are actively engaged in providing Window Glazing which has huge application in the commercial area. Our provided array is crafted by using modern technology. Window Glazing, Building Panels, Wall Partitions, Corbels, RCC Slabs and Cladding Materials. Mirror glass front window and panel structure.